I had been preparing for the Mojave Road for quite some time. We planned to do the 130-mile trail split up into 4 days so we could take our time and explore. It requires a 4 wheel drive vehicle, I also would highly recommend downloading offline topographical and satellite maps of the entire route along with taking the proper precautions of bringing plenty of water/food, extra fuel and a tire repair kit. I had purposely left my digital cameras at home so I could better connect to the landscape using just my large format Intrepid 4x5 mK3. If you have or do spend a lot of time in the desert there is a certain quality of peacefulness that it offers, one that I cannot quite put a finger on. It took me a long time to appreciate the beauty of the desert as I would say it is a very different type of beauty. One that in some ways you have to look for or be open to. Coming from Hawaii the desert was a shock to me. The Southwest United States has a lot to offer photographers in my opinion and there will be a lot who agree with me here. 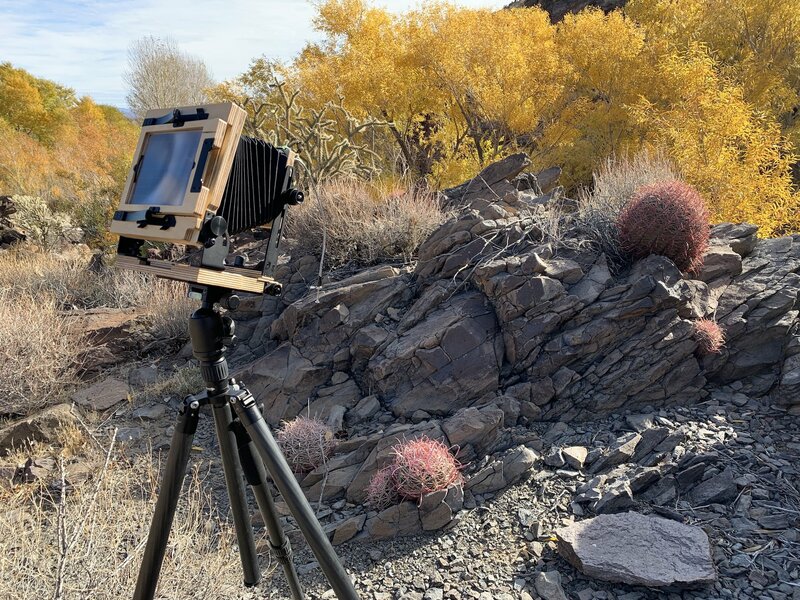 Well this is now how I recharge myself, taking in the subtleties around me, driving on a dirt trail to get to a beautiful scene, hiking through a lesser known slot canyon and composing an image through the ground glass. The trail begins at Fort Mohave, Arizona, in the Southwest United States through the Mojave Desert and ends in the Afton Canyon area of California. Traditionally it was called the Mohave Trail where desert-dwelling native Americans, Spanish Missionaries, explorers, and foreign colonisers from the 18th to 19th centuries used the trail running between watering holes across the Mojave Desert following it to the Cajon Pass, the gap between the San Bernardino and San Gabriel Mountains. These watering holes recur at intervals of about 60 miles. 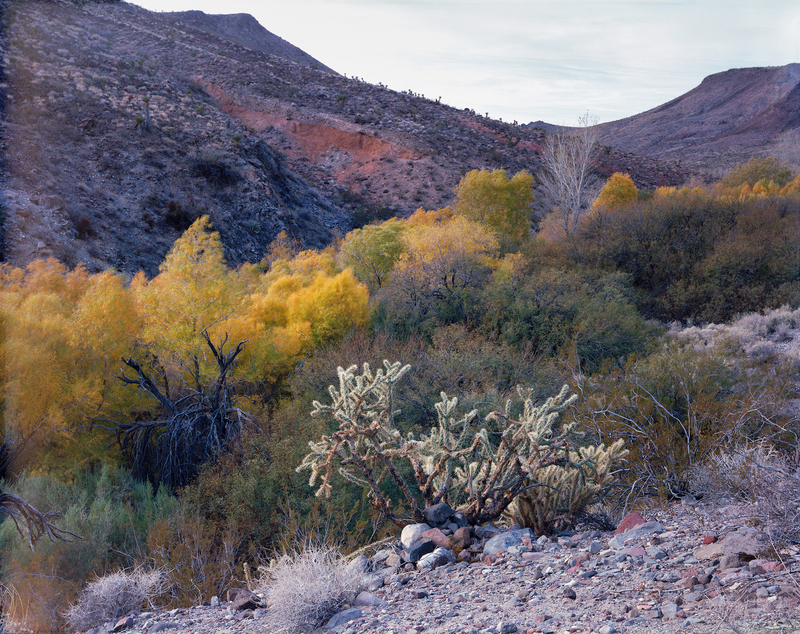 My first location to photograph was near the Arizona/Nevada state line and I found this scene which I felt lent itself well to a panoramic format. The highest rock very much looked like an Eagle to me, which was why I was drawn to photographing it. Pushing on through the trail we came upon these abandoned homesteads. The use of front tilt on my camera allowed me to have everything in sharp focus. Having gone for about 24 miles we made it to Fort Paiute/Paiute Springs which was our first camping spot for the night. This was a great watering hole for travellers back in the day. The next morning I sought to capture some of the fall colour that was in the area and I would have liked to have spent more time here. After camping at the Rainbow wells area we set off to cover some more miles having done about 45 the previous day. 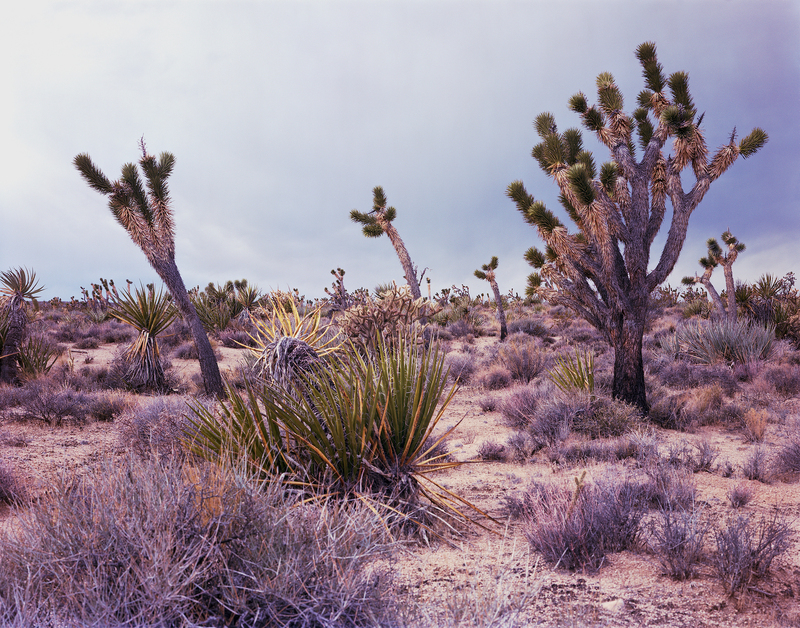 This area has a lot of beautiful Joshua Trees, much thicker growth and more dense than Joshua Tree national park. Day 3 was much fun. 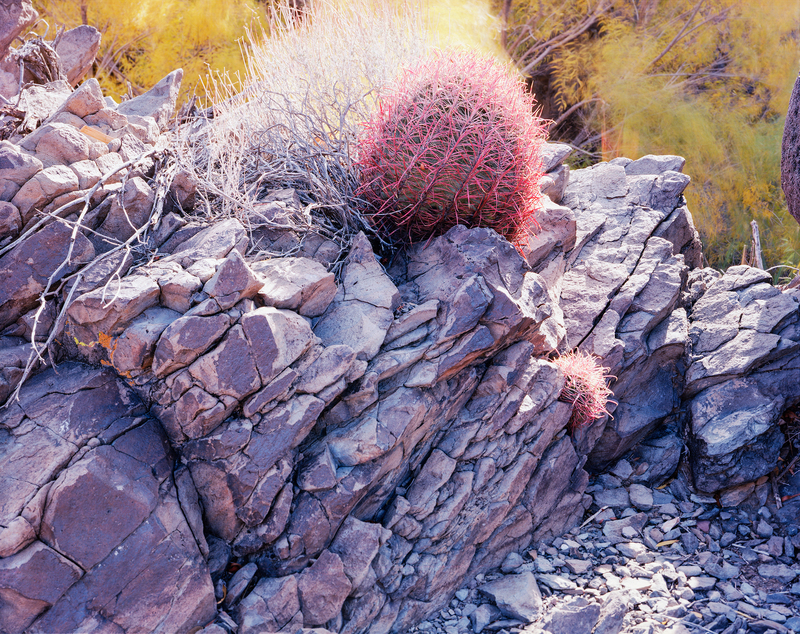 This first lush desert scene was actually quite challenging to find a good composition because in some ways the vegetation was too dense. After passing through an old mining operation in the area I found this unusual scene and knew I had to shoot it on black and white. 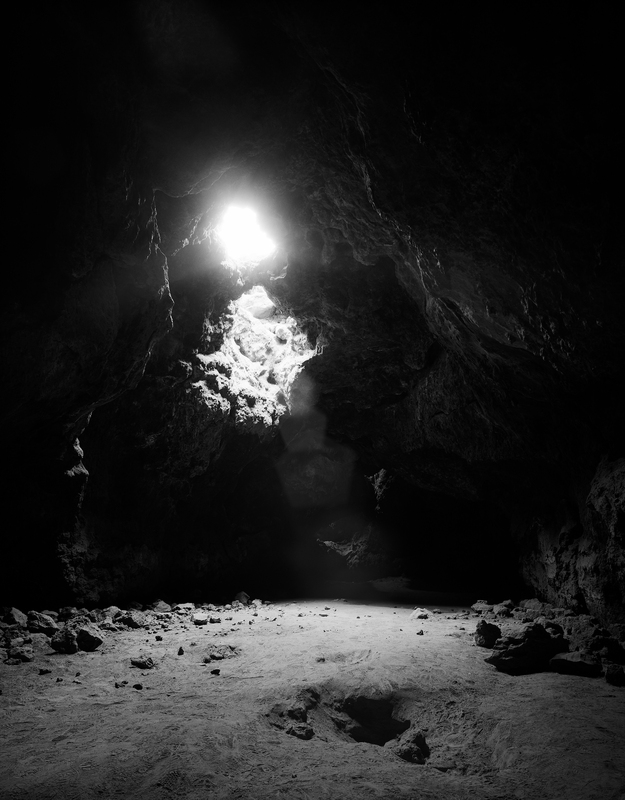 After exploring the beauty of that area we found ourselves at the Mojave Lava tubes which called for nearly a 3 minute exposure. After visiting the Mojave mailbox and the funny attractions people make in the desert such as a frog shrine, we set off to finally visit the Travellers monument, to finally place my Rock on the rock pile and read the secret message written on top of the rock pile located on Soda Lake which is for the most part a dry lakebed. This is an area where you can easily become bogged down and stuck so I wouldn’t recommend crossing after rain as it will be impassable, the terrain will be like driving through wet clay. After doing that and crossing the lake I immediately photographed the area as the sun was setting to get this beautiful golden light on the desert sand and thankfully the sky was filled with clouds. I photographed this area with the sun setting to my back. Well that was it for Day 3, which was fantastic for photography. On day 4, after having gone several miles through a dune field, which was fun but arduous in its own right, we had made it to Afton Canyon. It was raining so the soil had a nice saturated look for this next shot, which looked like a sea of jewels. With some front tilt I was able to have the whole image tack sharp. 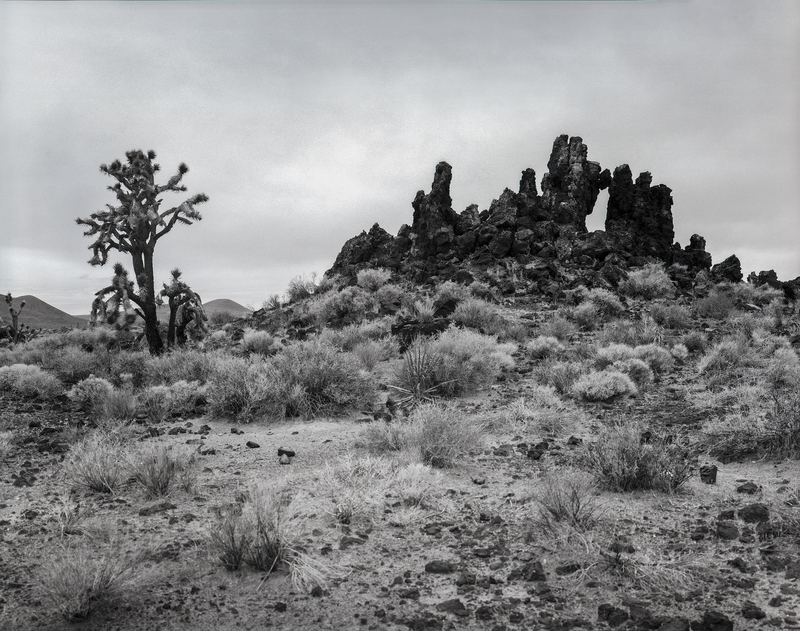 After going through the famous Afton Canyon river crossing and completing the end of the trail I knew I had to go back to photograph some more of the Joshua trees from where we camped out on Day 2. So I took the highway back to the area and setup my camera for this scene, which I had envisioned in a panoramic format. Maybe I’m crazy but it looks like these Spanish Daggers (Yucca) are almost dancing or even posing for me. The storm you see off into the distance eventually drove me out of the area but I was very happy with the images I had captured during this trip. There is something really special about large format. Yes it technically has higher resolution and better tonality than smaller formats but for me it is about the experience and the approach you find yourself with. It forces one to work a certain way, to be more methodical and thoughtful with how you photograph your subjects whether that’s people or landscapes. There is also something very special with working with a camera like this, in general how it operates is very different than roll film cameras. With all large format cameras there is more room for error though so you’ll have to be on the tip of your toes with the simplest of things. You could forget to stop your lens down, forget to close your lens when taking the picture, pull the wrong dark slide, make an accidental double exposure among other errors I’m sure I am not thinking about at the moment. It is a very manual process, one which I have come to greatly enjoy as these limitations can allow one to focus on their work better.